ST. GEORGE — A 15-year-old northern Utah teen was struck by a car while he was riding through a crosswalk on Dixie Drive Monday. The boy was northbound on Dixie Drive riding on the sidewalk just before 1:30 p.m. when he entered the crosswalk at Stonebridge Drive, St. George Police Officer Andy Mickelson said. A female driver pulled up to the crosswalk, looked left, then crossed over the stop line without stopping, not seeing the bicyclist. 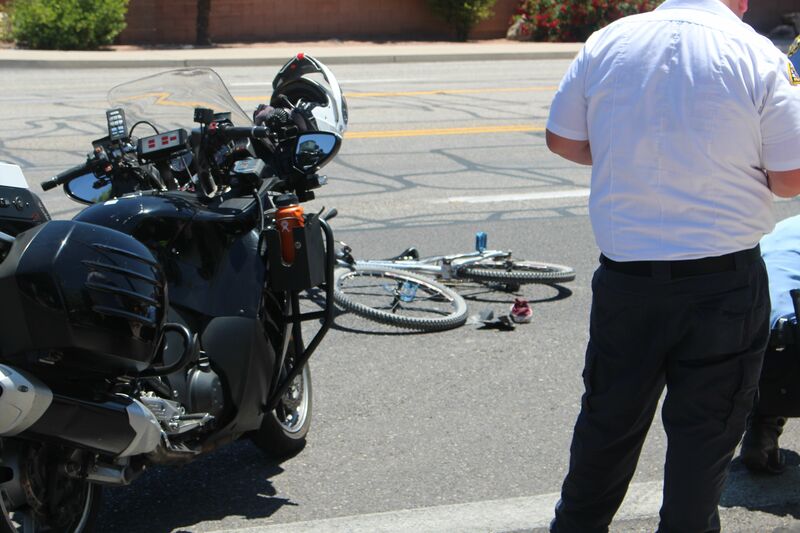 Mickelson said the cyclist, who was wearing a helmet, had some minor injuries and abrasions but was not transported to the hospital by ambulance. His parents showed up a short time later and chose to transport him themselves. The driver of the car, who was visibly distraught throughout the whole procedure, received a citation for failure to stop at a stop sign. Units from St. George Police Department, St. George City Fire Department and Gold Cross Ambulance responded to the scene. This report is based on preliminary information provided by law enforcement or other emergency responders plus personal observation and may not contain the full scope of findings. Ride thru here several times each week, and depending upon the traffic density, may take the sidewalk, only because drivers crowd the bike lane, both north and southbound. They must have missed the question asking about maintaining the 3 foot space for bike riders. In defensive riding mode 24×7, we have to assume that these folks are going to drive right thru the intersection, so stopping before entering is our safest policy option. One of the last sections of Dixie Drive that does not offer a biking/walking path alternative………. It is my understanding that a bicycle is considered a “vehicle” with the same rights and responsibilities as any other vehicle. They are required to ride on the right hand side of the road in the same direction as traffic. As a bicyclist and car driver I worry that bicycles on sidewalks are particularly at risk of accidents because they are often moving much faster than a pedestrian and so are not anticipated by drivers or pedestrians, particularly if they are going against the traffic direction. Some places it is illegal to bike on the sidewalk. Couldn’t really figure out the law here, but many sites online suggest it is dangerous and discourage it. Cars backing out driveways and pedestrians exiting buildings are other hazards of riding on the sidewalk.